In conjunction with the International Olympic Committee's conference going on in Copenhagen at the moment, there was a bike ride the other day. Here's a Spanish chap named Miguel Indurain. It was the only event that united all the people from the cities vying for the chance to host the 2016 Olympics. And what better, classic Copenhagen way to do so than a relaxed 8 km bike ride from Bella Center Conference Complex to the City Hall Square in Copenhagen. 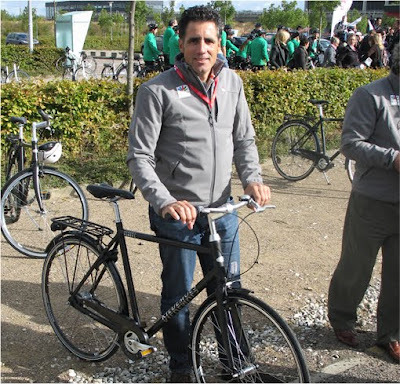 Miguel Indurain interviewed on foot and on bike. There were 59 Olympic medals represented by 30 Olympic winners, as well as a host of other athletes. Present were the likes of Miguel Indurain, Edwin Moses, Gustavo Kuerten, Michael Johnson, Jackie Joyner Kersee, Morten Andersen, Arancha Sánchez and Frank Fredericks. Obama arrived today. Funnily, I was returning home from Washington, DC and my lecture tour. I happened to speak with the pilot on the way to the gate and he said that we would have to fly extra fast so that we would beat Obama and Air Force One, who were scheduled to land at the same time. If we didn't beat them, we would have to circle over Copenhagen while the airport was shut down for the arrival of the prez. A heavy foot on the gas pedal and a helpful tailwind saw us arrive 50 minutes ahead of schedule - a rarity these days. So I made it home to have breakfast with the family instead of being delayed by one man's privileged arrival at our airport. The rumours are that if Obama showed up to pitch for Chicago's bid then he won't show up for the more important COP15 Climate Conference in December. Mostly because he won't have anything to offer, because of political reasons in DC.